Despite being drenched from heavy rains, teachers are undeterred as they went on strike for the first time in 30 years today, spurred on with visible support from parents and students rallying with them. Over 30,000 educators from across the Los Angeles Unified School District, the nation’s second-largest school district, went on strike as LAUSD and the United Teachers Los Angeles union have not been able to reach a compromise after two years of negotiations. The teachers’ union is fighting for increased wages, reduced class sizes, increased staffing and are advocating for more safety and less testing for the 640,000 students they teach. LAUSD claims meeting UTLA’s demands will cause the district to go bankrupt as they don’t have enough funds to fulfill them. Union members believe LAUSD is simply incorrectly using their budget for charter schools, which they perceive as a great threat toward public education. After 16 months of bargaining and three failed mediation attempts, UTLA was ready to strike this past Thursday. 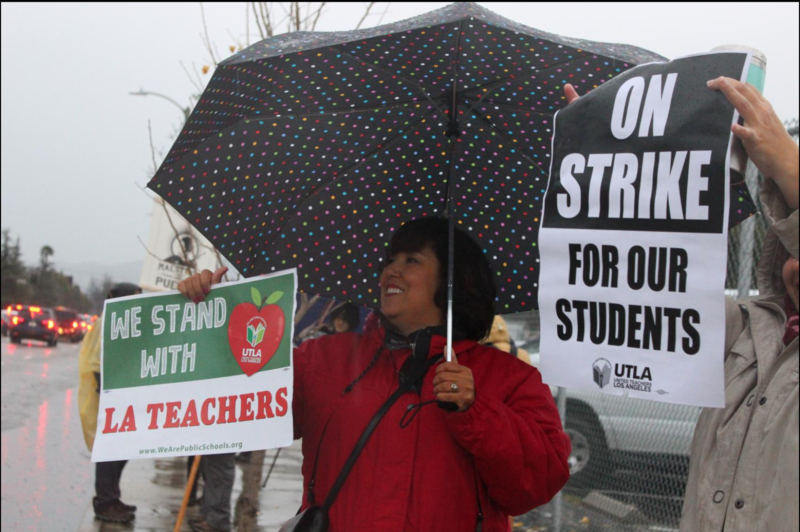 However, the date had to be pushed forward to Monday because of conflicting reports regarding when UTLA gave the 10-day notice needed for the union to legally go on strike. According to Jennifer Walker, resource teacher and chairman of UTLA for Daniel Pearl Magnet High School (DPMHS), there were no negotiations between LAUSD and UTLA on the first day of the strike. The confirmation of the strike left many parents and students in the dark as to what the district will do with the apparent lack of teachers. Without them, there are no lesson plans or sufficient supervision for students, leading many to question the safety of students during the strike. In preparation, LAUSD reportedly hired over 400 substitute teachers, who are being paid more than regular substitutes. Additionally, they are sending 2,000 district employees who aren’t part of the union to help cover the empty positions. Yet for the about 900 schools participating in the strike, it is not enough to help cover the students, let alone teach them. The lack of supervision prompted parents to keep their children from coming to school. According to Administrative Assistant Lubia Gutierrez, approximately 178 students attended DPMHS today and about half of them were picked up early throughout the day. While teachers were picketing outside of DPMHS, students were being separated into three groups based on their last names and spent time watching movies. The groups were stationed in the multi-purpose room, science teacher Steven Schaffter’s room and the cafeteria. Students in the cafeteria were eventually moved to English teacher Cynthia Wald-Barry’s room. Each station lasted two hours and students switched rooms after nutrition and lunch. Parents assisted both the teachers and the school in various ways throughout the first day of the strike. Some parents volunteered to help supervise and the Parent Teacher Student Association (PTSA) posted a sign-up sheet online that was created by Gabriela Chavira where parents could donate food and supplies to the teachers outside striking. Teachers are not only setting up picket lines outside of their respective schools to garner attention for their cause but are also rallying at Grand Park on Jan. 14 and 18 at 10:30 a.m.
On Jan. 18 at 10:30 a.m. teachers from the San Fernando Valley’s West Area will rally at Victory and Balboa near the local district offices. They’ll be joined by students and parents who support their stance and their own family, such as that of history teacher Franky Ortega who was picketing in the rain with his four-year-old son. They fight not only for their students but also for their own children to have a better public education.